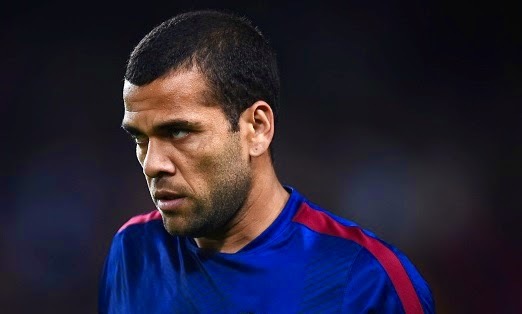 Manchester United are set to beat Arsenal for Barcelona right-back Daniel Alves as the player looks for an exit door in the summer, as per the Metro reports. Alves’ contract will expire at the end of the season and has no new offers on the table by Barcelona despite of their ban in the transfer market. The Red Devils have been linked with several full-backs in the winter window including Seamus Coleman of Everton and Nathaniel Clyne of Southampton. It was also reported that United would go for Seamus Coleman if they fail to land Alves from Barcelona in the summer. Coleman would cost around £20million which is a big amount, but his wages will not be big like Alves. United are in need of a right-back as their current right-back Rafael is yet to cement his place in the starting lineup. Manchester United are planning a £100,000 a week offer for the Brazilian full-back who will turn 32 in the coming May. Arsenal boss Arsene Wenger is also keen to land him but will not be able to give £100,000 wage. Alves is an experience defender, he has played more than 200 games for Barca since his move from Sevilla.